Universal Transport Carts type 1 are used for transport of heavy goods of any kind. The Universal Transport Cart type 1 consistsof a drive unit and a load pick up fix connected to it. The frame of the drive unit and the load pick up do build a common cart chassis. Within the area of the drive unit there is the drive with the steering- and driving wheel as well as the complete hydraulics and electrics / control of the cart. The Universal Transport Cart is driven by 48 Volt forklift batteries. The load pick up is adopted to the customer-specific demand. As standard version the load pick up is built like the plate of a table, on which the load is transported. Length, width and loading height of this load pick up are dimensioned according to the load to be transported. Suitable to the good to be transported, the load pick up can be equipped with suitable fasteners to safeguard the goods to be transported. 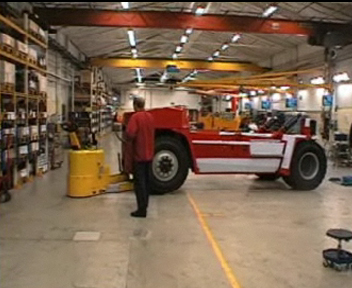 As far as the Universal Transport Cart UTW type 1 should not be loaded by means of an overhead crane or another lifting tool, it is advisable to position the goods to be transported onto suitable transport cradles, which can be crossed below by the Universal Transport Cart and can be lifted for transport reason. For this the Universal Transport Cart type 1 will be equipped with a lifting installation. The lifting height of the cart has to be adopted to the height of the transport cradles. As special executions the Universal Transport Cart UTW type 1 also can be built as a "tow truck" for inhouse transport of heavy trucks and .track vehicles during production process. The operator usually walks behind the cart and controls it by the handle. The steering function is supported by hydraulics. The speed can be adjusted stepless via the throttle switch at the handle. The Universal Transport Carts type 1 optionally can be equipped with a radio control, to enable the operator to choose the best possible position for himself for manoeuvring the cart. Optionally the Universal Transport Cart UTW type 1 also can be equipped with a ride on platform on which the operator can ride during driving the cart. You intend to do inhouse transport of heavy loads, also with unusual dimensions? Then we should talk about the use of the Universal Transport Cart UTW type 1. Please inform us regarding weight and dimensions of your transport goods and the transport conditions to be expected. We are prepared to provide you with an offer, configurated to your demand.